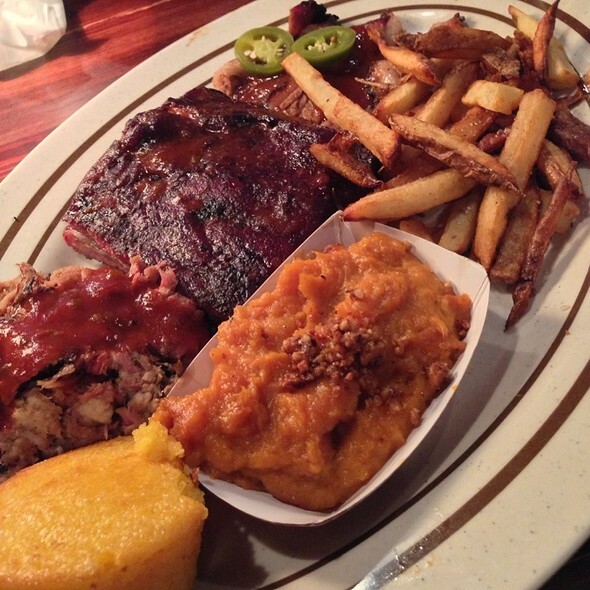 The Syracuse-based barbecue phenomenon plunked a sprawling roadhouse with all the familiar back-road accoutrements into an abandoned meat factory. Unfinished wood-beamed ceiling, burlap bag curtains, scattered country bric-a-brac, and an enthusiastic greeting feel worlds away from the city. The roll call of devotees includes area families, couples on casual dates and groups of Columbia students. Though fried green tomatoes and punchy boiled shrimp start things off right, the smell of smoking meats quickly adjusts the focus. The smokey-sweet pork ribs gently release from the bone and the Texas brisket, a touch dry, gets a lift from a topping of tangy cured jalapeños and a dash of hot sauce. It's even safe to venture from red meat with the truly moist and tender chicken, brined then smoked for deep flavor. With the exception of the cakey corn bread, sides keep pace, with tangy Creole potato salad and sweetened baked beans the standouts. Two private party rooms for parties from 15 to 150 people. Our goal is to ensure your party, business meeting or specialized event is a rousing success. We’ll provide full customization to suit your needs so you don’t need to sweat the details. Salad dressing: bar-b-blues house, cayenne buttermilk ranch, blue cheese, honey mustard. Spicy shrimp boil, chicken wings, fried green tomatoes, deviled eggs. Peel & eat shrimp cooked in a boil of beer, herbs & spices. Served cold with habanero cocktail sauce. Spice-rubbed, pit-smoked, then finished on the grill. Served with maytag blue cheese dressing, celery sticks and your choice of sauce: mild honey bbq or hoisin sesame, hot wango tango or jerk glaze, hotter garlic chipotle, hottest devil's duel. House smoked salmon, crispy fried with red peppers, corn & chives, creamy creole mustard sauce. Pulled pork with pickles, brisket with pickled onion & jalapeno relish. A.k. Chili, house queso sauce, crispy tortilla chips, red onions, pickled jalapenos and chipotle crema. Our own homemade smoked "hot link" sausage served with house pimento cheese, black pepper cheddar crackers, pickled onions & jalapenos. Mixed greens, seasonal vegetables, spiced walnuts with choice of dressing. Top the chop, choose from pulled chicken breast, sliced brisket or pulled pork with choice of dressing. Topped with homemade pimento cheese and house-cured chow-chow. All plates include honey hush cornbread and 2 homemade sides. 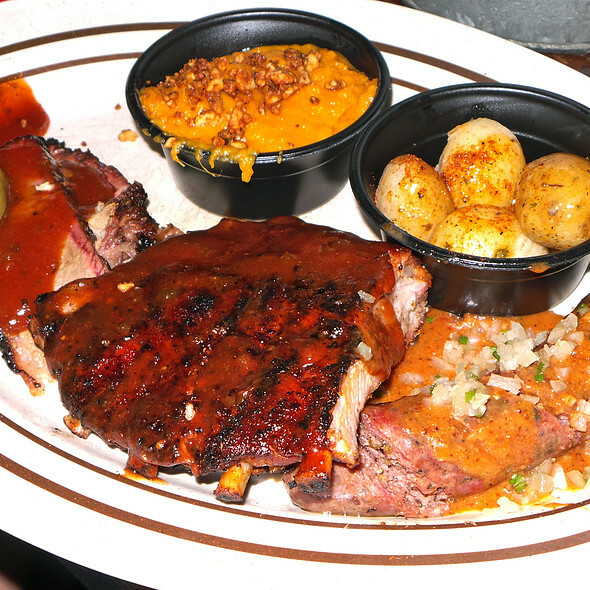 Our st. Louis ribs are dry rubbed and slow pit-smoked, then lightly glazed with our original bbq sauce. Pork shoulder smoked low & slow. Hand-pulled and piled high. Served with brooklyn brine pickles. Slow-smoked, hand-sliced, and house-cured jalapenos. 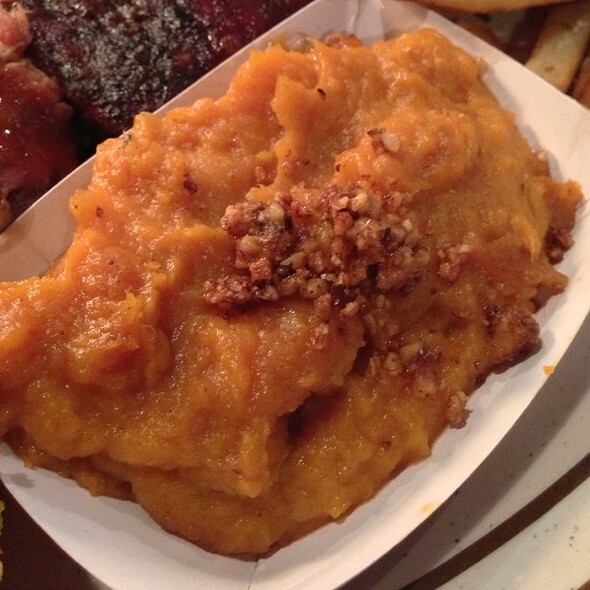 Apple-brined, pit-smoked and served with our original bbq sauce. Ask about our side of the day. Cross-cut beef ribs braised, marinated in soy, sesame, and ginger. Grilled and served with hoisin bbq & toasted sesame seeds. 12 oz angus beef, bbq rubbed & grilled. Served with sauteed peppers & chimichurri sauce. 8 oz. Pecan crusted salmon fillet, spice rubbed & grilled. Served on a bed of curried succotash with a jerked bbq glaze. Add 1/4 pound of drunken spicy shrimp to any combo for $6.50. Any 2 - $17.95, Any 3 - $21.95. Served with brooklyn brine pickles. Platters include 2 sides. The genuine article! Smoked low & slow. Hand pulled & piled high. Pulled pork piled high. Topped with brooklyn brine pickles. Hoisin sesame bbq, shredded cabbage and sweet & sour green tomato relish. Pulled pork, ham, swiss, brooklyn brine pickles and mustard on a pressed roll. Premium beef slow-smoked and hand-sliced. Lightly slathered with bbq sauce & horseradish mayo. Sauteed onions & peppers with cheddar on a pressed cuban roll. Bbq brisket topped with our own hickory-smoked bacon & swiss. Bbq sauteed onion with blue cheese, and pickled jalapenos. Grilled mojito breast lightly slathered with our original sauce and bbq mayo. With cheese, lettuce, tomato & onions. Bbq caramelized onion, smoked portobello, swiss and brooklyn brine pickles. Our own hickorysmoked bacon, sauteed mushrooms & swiss. Smoked chicken with sauteed peppers, pickled onions & bbq jerk glaze. Served on a pressed cuban roll. 8 oz. Black angus beef. House bacon, bbq caramelized onion, swiss and pickles. Bbq caramelized onions, crumbly blue cheese and pickled jalapenos. 6 oz. Turkey, seasoned, grilled, & bbq basted. Served with bbq mayo, tomato, red onion & pickle. With grilled zucchini, roasted peppers, swiss, red onion and bbq mayo. Fried green tomatoes, pimento cheese, shredded cabbage topped with chow-chow and bbq mayo. Bbq brisket layered with cheese and jalapenos. Topped with pulled pork and coleslaw. The restaurant it self was a little worn down but I think that was part of their theme. The hostess was great and offered us a booth and it was ready in a few minutes and the manager was great as well. The only issue was our server she took about 15 mins to drop our check and repeatedly walked passed us and forgot our drinks or just took to long. At first I understood since she did have around 7 tables to take care of but at the end of the meal there only about 3 left. She wasnt a very a good with the service. The chicken steak was delicious, my pulled PROK sand which was okay and the Mac and cheese was weirdly seasoned but the corn bread was delicious! Great place for a family get together. Food for all, welcoming. Fun. Loved it , the food was so delicious, the service was great our waiter was amazing . Will go back in the near future. We have come to Dinosaur BBQ for years! Unfortunately things have changed. The restaurant feels dirty and greasy. The chicken was under cooked. The order was't right. The bathrooms were dirty and not kept well. The restaurant was very hot- the AC wasn't sufficient. We felt sick and left as soon as we could feeling like we don't want to return. We have been coming for so many years- and it seems like it is going downhill. 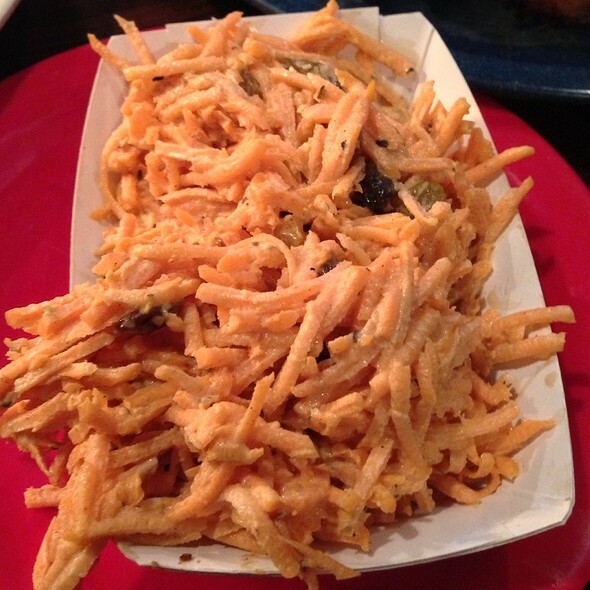 There is nothing healthy offered on the menu, and the plastic plates are all scratched up and the tables feel greasy. I literally felt sick being there. Our family used to look forward to going to this restaurant- but now feel like we don't want to come back. We had been coming here for a decade. Disappointing! 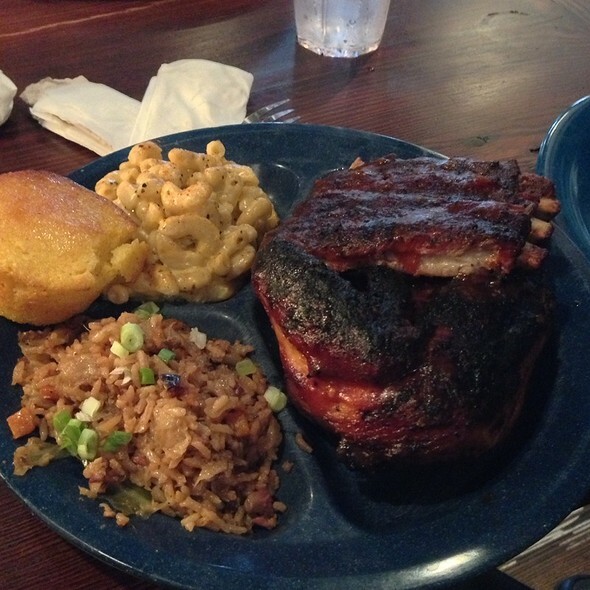 Dinosaur BBQ raised their prices, but offered nothing more or better and has not kept up with the times. Great food. Service was a little slow but not annoyingly so. Glad we had a rez bc it was mighty busy on a Sunday! This was not our first time dining at the restaurant. We came to celebrate Father’s Day as my husband and father really enjoy the food here. I also held my baby shower in their event space upstairs which went off without any issues. My negative review is due to our last visit here on Father’s Day. The place was unusually not as crowded as I would have expected for Father’s Day. We were seated promptly as we had a reservation. We came with three children under 4 years of age and in total were a party of 8. Our appetizers and drink orders came out late, we waited for them for about 30 minutes. But had no idea that this was the beginning of the most horrible service we would experienced at this place. We then waited more than 2 hours for our food! After complaining to our waitress and manager, they brought out a children’s plate that all kids had to share as they were starving and growing very impatient. The manager finally came out with the rest of our plates. Some had certain things missing and replaced by other times as he said they had ran out of certain things we ordered. He gave us a discount but the entire party came out feeling completely disastify with the food and service. We were a party of 10 present for a business meeting, and were cramped into a table with hardly any room. I had to sit sideways as I was pushed on a wall; very uncomfortable. The service was sub-par as we waited 30 minutes alone for water. Our waitress seemed overworked and could not juggle all the tables she was serving. As being a party with the most guests and an included gratuity, it would have been nice to see and speak to our waiter more as we had several issues one including them missing 2 members orders. The food was amazing but the service really has us questioning whether to come back again. We love this place. 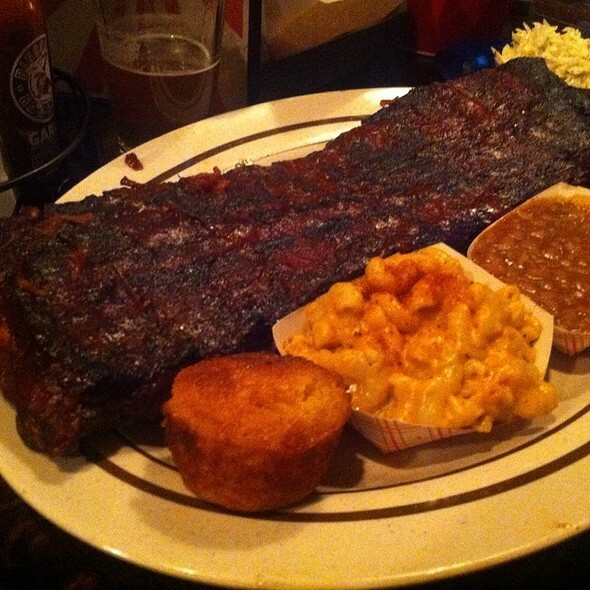 N to only does it have the best ribs but it gets a great mix of people. Everyone who works there does a terrific job of making the meal a relaxed event. Food isn’t as good as it used to be . Ribs were ehhh. Second time in a row disappointed. Great sevice. The waitress, host at the entrance, everyone just super friendly! Excellent food. Pretty good service. Super loud, so not ideal for dates. Excellent service provided by Mel - very attentive and helpful in deciding with what to order. The food was delicious, I enjoyed my time my only complain would be the cleanliness of the rest rooms . BUT the feed was really yummy! Food was great ,Service was slow but good was worth the wait. Food was not as good as it used to be. Service very slow. Very good food just in time for the Memorial Day holiday. Our service was really good and the wait staff was very attentive. The donkey punches are amazing. First time at Dino bbq went there for my husband’s birthday Food was amazing. Nice variety of beer. Service was outstanding. Kevin our waiter was very personable. His recommendations were top noch. We are foodies,My husband works in the restaurant industry so he is picky ... he still talks about how awesome this place is , will be our new go to place. The food, service and ambiance was great. I was blown away from the amazing food. Reorders were slow, but food always amazing. Very good food, huge portions (had the family special), friendly, helpful waiter. Overall a great deal--and lots of fun. Recommend the cubano sandwich, green fried tomatoes and cheesecake. The host Tatianna was very accommodating . I was late for my reservations and I called in before time and she told me to come in when my spouse and I arrived to the restaurant we had a short wait . She was very kind and calm despite the place being extremely busy . My spouse and I are regulars @ this place ! The food is always delicious . We will not be coming back - used to be so good and now dirty, mediocre food and terrible service. Our food was good but not as delicious as usual. Our entrees came out before our appetizers. All the food was lukewarm and the apps were cold. The restaurant was not busy but our server was overworked. No one greeted us upon being seated. Our drink orders were taken over 15 minutes after being seated and delivered much after that. We asked for water in airgun Mukilteo times but did not get it until after our entrees came. This was all very disappointing as this was a belated mother's day celebration. We had so much fun at Dino for my sister's bachelorette party. It was truly the perfect place to get some delicious food and have some fun! We were seated quickly but had to wait for service quite some time. Then when she arrived she seemed to have some sort of attitude which made me want to leave right then and there, but we stayed since we traveled a great distance to try. Food came out on silver trays reminded me of prison. The ribs were good the brisket and pulled pork tasted like lighter fluid and very fatty. The mixed greens were from a can. The beans and rice had no flavor. 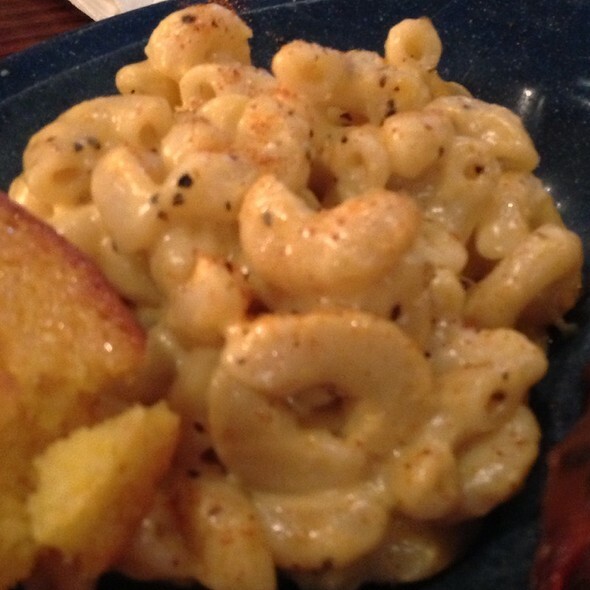 The only thing worth having was the mac and cheese and the salted potatoes. I will definitely not try this place again nor will I recommend this place to anyone. I feel it might taste a lot better in Syracuse since that was the only reason I wanted to try it a taste of home. I’ve had BBQ in alarmist every state and likely every type. This was some of the best stuff I’ve eaten. I’d normally not get wings and a Cuban sandwich, but I split it with our party, and was not disappointed. We've been here on multiple occasions where this establishment has been packed to the max with ppl lining up outside waiting to get in. That was not today's atmosphere....The good: The hostess was great and we were quickly seated. The bad: Our waiter seemed overwhelmed or just didn't care he rushed us to order our appetizers & meals and then ran off without taking our drink orders. It took about another 10-15 mins to locate him to order our drinks. Once, we received our drinks he disappeared for the rest of the night. When the meals finally arrived only 4 of 6 received our meals. It took over 35 mins from when the meals originally arrived for the last person to receive theirs. 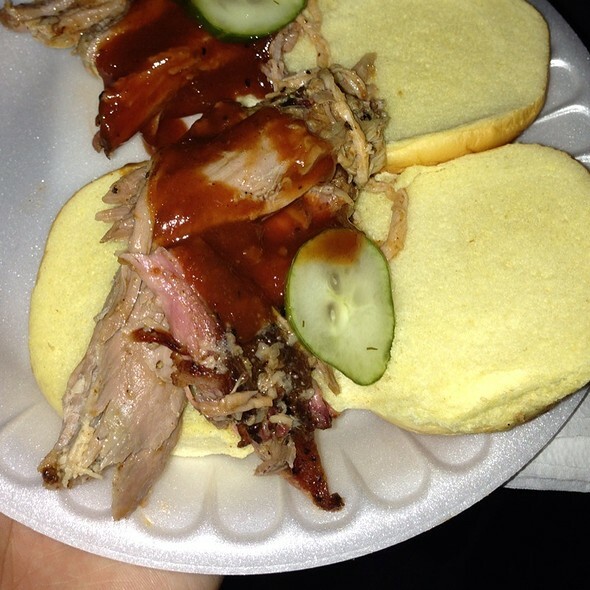 Mind you she only had pull pork sliders, pull pork being the same meat 2 of the first orders had. Our waiter finally showed up at the very end only after I had complained to 2 separate hostess. Too little too late by then she had received her meal and we just wanted to go home. A lady who introduced herself as the wait staff manager comped us for the 2 meals that were forgotten/lost (who knows? we were never given a reason for the extreme delay) but we would've preferred to have great service before anything else. I had made reservation and was told I would be seated in a few minutes. 45 minutes later I asked hostess how long was the wait and I was seated right away. I was skipped over several times. If I had. Not asked I would had probably still be waiting. 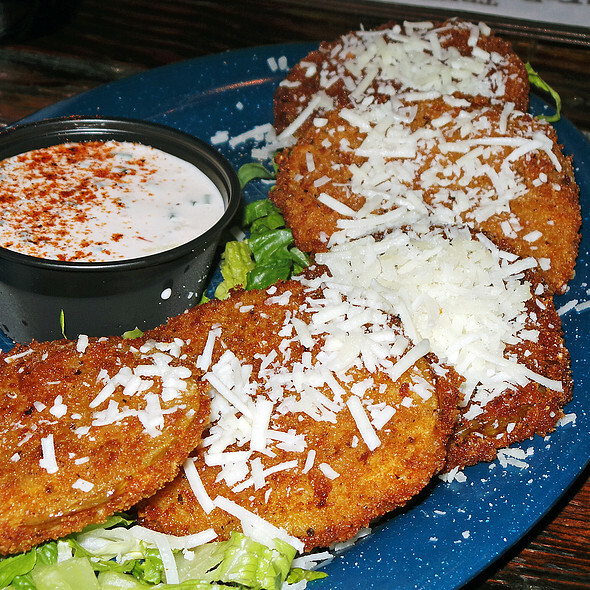 The fried green tomatoes were great and most of the apps. The ribs were a bit burned and dry. lol I had a ribeye made perfect but had zero taste. I had to put some butter and salt. Good place to go for drinks and apps. Everything was pretty good! Definitely a good value. Great customer service and delicious food. Had reservations accommodated me quickly. Food was good with decent portions. My ribs were a little on the salty side but all was good otherwise. My next meet up can be there. We had a reservation but still had to wait nearly 30 min for our table. Very accommodating for our large group. This was the perfect spot to celebrate a birthday. The special drink options were also great.